Around this time last year, I wrote that the function of the Doctor Who Christmas special – if we must have such things, although that’s a whole separate argument – should be to entertain people who don’t usually watch the show, and entice them into full-time viewership. It would be nice, for example, if someone were to be amused and interested by a Christmas episode, to the extent that they then checked out the next series, before then looking into the recent history of the show starting with Eccleston, and then eventually delved into Classic Who and realised how much better that was. I don’t have the viewing stats to hand, but I’d be willing to bet that at Christmas there are a good number of people watching Doctor Who that normally don’t – in the houses of Who-obsessed relatives, for example – and this is thus a good chance for the writers to evangelise. Emily and I watched this episode alone, and I was glad that we did. Because while it felt more Whovian than last year’s instalment, it was practically impenetrable. Despite the hopeless Neela Debnath’s insistence that “it works as a standalone due to the simple story and the self-contained nature of it” (a comment I suspect she wrote about halfway through her first viewing, and then forgot to delete), you really can’t watch this without knowing what’s come before. It’s like trying to watch The Two Towers without seeing Fellowship of the Ring first. It hangs together as a standalone narrative, in that it adheres to the three-act structure, but the character’s motivations are going to be one big haze, and you’ll spend most of your time wondering why Vigo Mortensen doesn’t want to be king, wishing that John Rhys Davies would shut up (more on that later) and wondering why on earth Liv Tyler is there at all. It’s just about enough to be told, for example, that the Doctor has suffered a loss and that this is what’s made him grumpy. Certainly this is not a man that you’d want to see leading a family drama series in his current state, and not someone you’d necessarily like if you didn’t realise that he was normally a lot chirpier. He’s become the burned-out cop who is hauled back in for one last job, engaging with society only reluctantly, and living in a castle on a cloud. Knowledge of the supporting characters, too, is inessential – although it would help, surely, to know that The Doctor is being assisted by two alien races (fine, the Silurians are more like flatmates) acting very much against type. The inexplicable return of the previously deceased Sontaran is mentioned only briefly, as the Doctor tells Clara that “another friend of mine brought him back”, so this is presumably something that Moffat is going to be explaining at some point in the future, in that smug-but-annoying way he does. Then it gets to the last ten minutes, and all hell breaks loose. Clara Oswin Oswald – as a standalone character – just about worked. We learn almost nothing of her past or motivations during the hour or so that we get to know her; one would assume that she keeps her double life a secret because class warfare was so rampant. In terms of both costume and voice she flits between being Mary Poppins and Nancy, the barmaid from Oliver Twist – her red button-up dress is a direct homage to the latter, and when she’s first seen collecting mugs in the Rose and Crown I half-expected her to start singing a chorus of ‘Oom-Pah-Pah’. 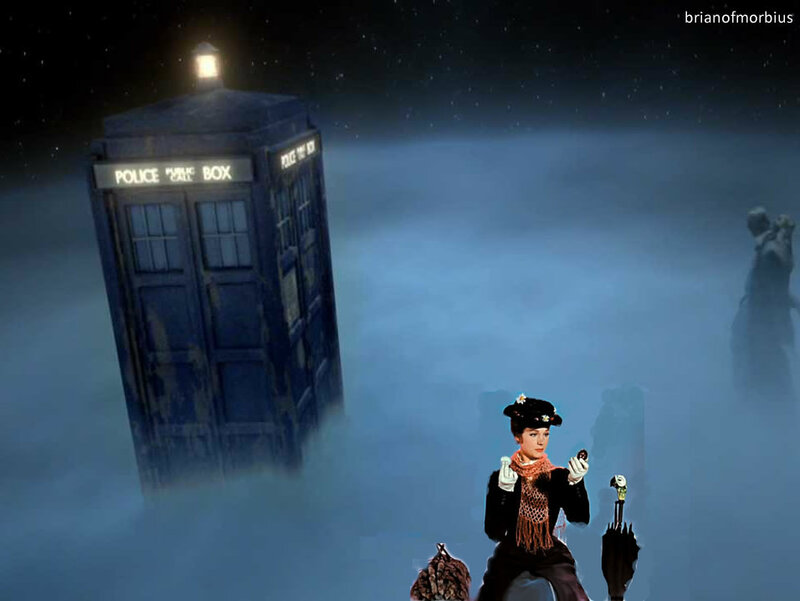 Later, she is seen climbing a stairway that leads to the cloud where the TARDIS is parked, and – oh, well, one thing led to another. I spent the first five minutes wondering why on earth the Doctor failed to recognise Clara, before recalling that the last time we saw her, he didn’t – or at least he saw nothing except a Dalek shell. The voice conjures up memories but it isn’t until the soufflé reference that the penny finally drops, before rolling down the drain of ambiguity into the sewer of general confusion. Because let’s face it – if you didn’t know that the actress who played Clara appeared in the last series as a marooned traveller with a very similar name who turned out to be a Dalek, you’d be hopelessly confused even when it was shown in flashback. It was explained, but even the explanation was unnecessary, because if you know what they’re talking about you don’t need to hear it again, and if you have no idea then someone else in the room will be able to explain it better than Moffat did. It was a shoehorned explanation, no doubt submitted for the approval of the board, rather than anything that worked from a writing standpoint. Of course, the next season’s arc is established even before we know the title of the first episode: it will be Clara / Oswin / Jasmine and her mysterious omnipresence. 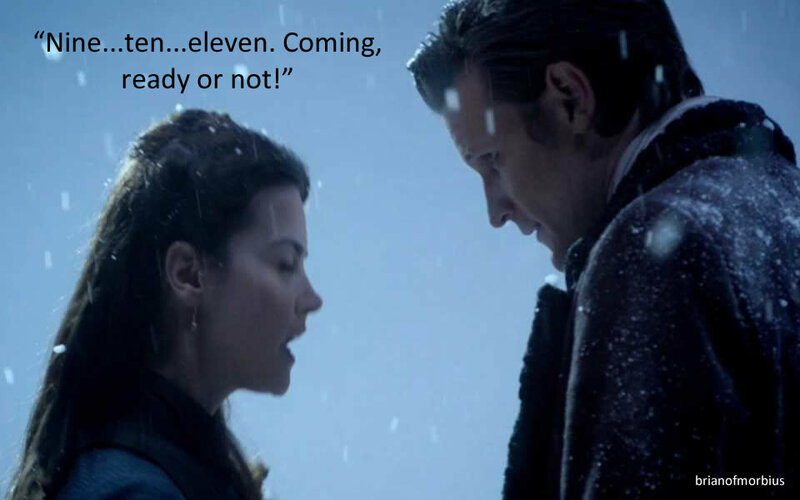 One assumes both from the ending and from the trailer that followed ‘The Snowmen’ that he’ll meet at least one more version of her and that they’ll travel together – or perhaps the unnamed Oswin that we saw in the episode’s final scene is simply another incarnation who will meet their doom at the end of the first episode, like a highly condensed version of Blackadder, and the whole thing’s going to become incredibly stale in about three seconds flat. Killing a future companion once is one thing, killing them twice is intriguing, but if this is something Moffat’s going to do every week it’s going to get very dull very quickly. I shouldn’t be surprised, of course – our chief writer is renowned for self-borrowing and a companion who meets multiple deaths over and over again is something he’s never done before in the show, ever. More than this, is it really necessary to have – once again – a companion that’s the centre of the show? Oswin’s been described to me (by Gareth, summarising) as a plot device with a pretty face, in much the same way that Amy / Donna / Rose were consigned similar fates. Admittedly some of the Classic Who companions were pretty vacuous, but their role was solely to be reactive rather than proactive – responding to cataclysm rather than being the cause of it – and at no point did the show really suffer for this. The role of the companion, we’re constantly told, is to be our eyes and ears into the Whoniverse – the person to whom we’re supposed to relate – and while I don’t really believe that this has to be the case, Moffat’s alternative is another example of him writing characters to fit the plot, rather than the other way round. There were several other things that annoyed me. 1. Richard E. Grant. I know that telling a coherent story in the space of an hour was always going to be a stretch, but is it really fair to ask one of the finest British actors around to appear in Doctor Who as the villain and then give him nothing to do except look menacing and growl a bit? It was like watching all those character actors in Harry Potter, standing around and muttering their two lines of dialogue before cashing the cheque and heading off to The Late Show for the publicity interviews. 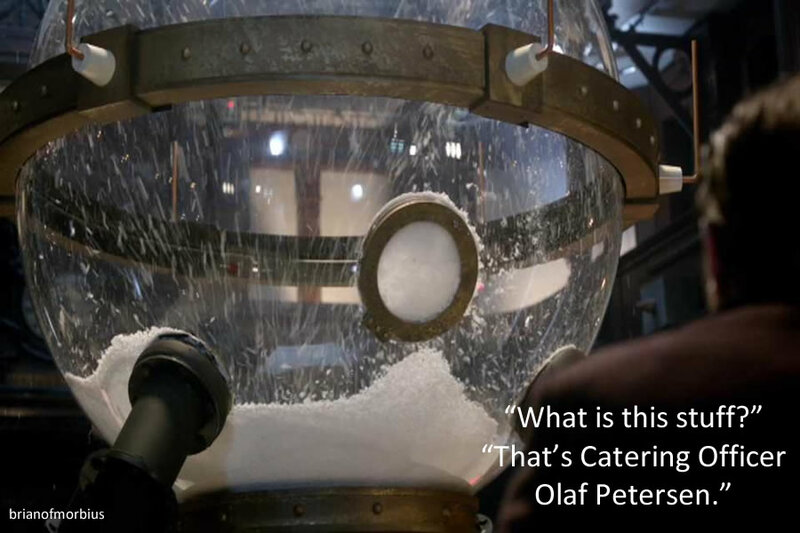 Both the snowmen themselves and their creator were a colossal McGuffin – the episode was really about Clara, and we knew that – but by the end of the story we still knew next to nothing of Simeon’s motivations or backstory, and his entire presence seemed a bit of a wasted opportunity. 2. 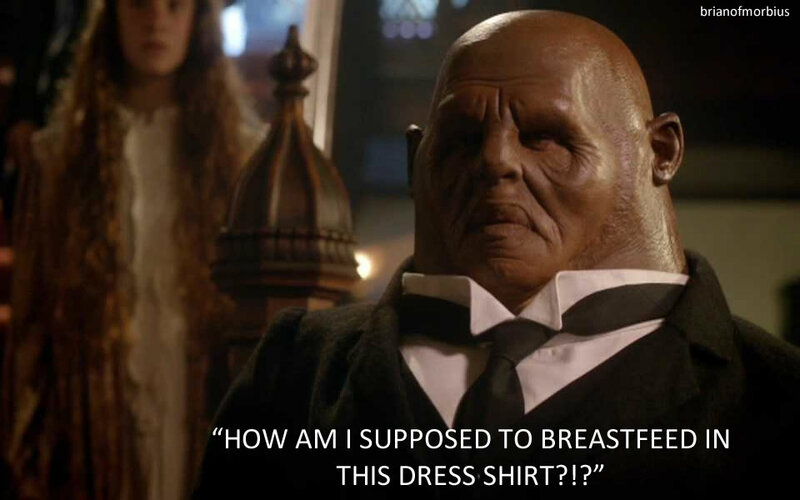 Strax’s use as comic relief. Come on, Steven. It’s not enough that you have a lactating Sontaran – you have to turn him into the “short, funny character”? It’s Gimli the dwarf all over again. I’ll grant you that the sequence with the worm was amusing, but when Strax appeared for the third time in the hallway asking about grenades I was about ready to put him in the oven and cover him with tuna or butter (god knows the episode had enough cheese already, but we’ll come to that). 3. The ending, in which the snow melts because a family is crying. Read that again. The snow. Melts. Because. A FAMILY. Is CRYING. Onscreen it was bad enough, albeit glossed over with lots of soft lighting, mournful looks and Murray Gold schmaltz. Condensed into a sentence in the cold light of day it is exposed for the atrocity it was: a dreadful, third-rate finale unworthy of any family show, least of all this one. Only Russell T Davies has written worse. 4. The excessive use of ‘Doctor Who?’. It’s bad enough that they do it once. I got to three. There may have been more; I stopped counting. It wasn’t all bad, of course. The new titles and theme music work well – gone is the irritating counterpoint that cluttered Murray Gold’s earlier arrangements, and the drums have been turned down. It’s still too loud and too brash but it’s edging closer and closer towards the versions that actually worked, even if the backdrop now looks quite close to what the Beeb were doing in the eighties during Sylvester McCoy’s run. To give you an idea, here’s the two of them side by side. We may never go back to the sinister (and quiet) moodiness of the original, but this may be the closest we get, and whatever happens next, this was a step in the right direction. Likewise, the stripped-down TARDIS interior – reflecting a colder, moodier Doctor – was a throwback to the classic console designs of old, and when the doors opened for the first time I almost cheered. Mention should also go to the striking visual approach they took – from the writing in the snow in the opening scene to the washed-out colour in the gardens of the Latimer residence, where Clara and the children were saturated against a subdued background in a subtle rendering of the tricks Spielberg was using in Schindler’s List. It really was very effective, particularly in HD, and a welcome change from the excessive browns that ruled the roost the last time Jenna-Louise Coleman made an appearance. The snowmen themselves were similarly impressive, although we saw too little of them for any lasting impression to be made – that’s probably for the best, as excessive sight of the monsters was one of the nails in the coffin of the Alien franchise, but suffice to say they resembled an evil version of Michael Keaton’s Jack Frost character. Similarly, the cast acquit themselves well, and even Richard E. Grant made the most with what he had. Smith’s transformation from grumpy loner to the life-affirming Doctor we’ve come to love was executed with his usual panache – the divesting of Amy’s glasses, unseen but implied, was a particularly nice touch, and if he regained his zest a little too abruptly that’s largely the fault of the script, not the performer. Coleman’s job was to be feisty (which I’ve complained about before) but she was never less than watchable. Ian McKellen’s voiceover was competent, and complaints about comic relief aside, the Strax / Jenny / Vastra combination worked well – although I do wish that Moffat didn’t see the need to hammer home the lesbian thing as if it were something to be smug about (hey, look, Doctor Who is politically correct! Who knew?). 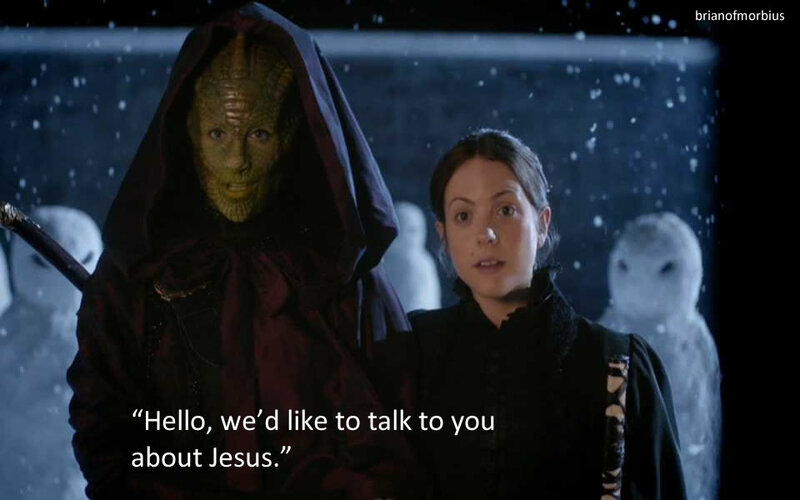 It did, of course, mean that Madame Vastra got the episode’s best line, arriving on Captain Latimer’s doorstep with Jenny and Strax in tow and announcing “I’m a lizard woman from the dawn of time, and this is my wife”. But as a whole, the episode probably got more wrong than it got right. 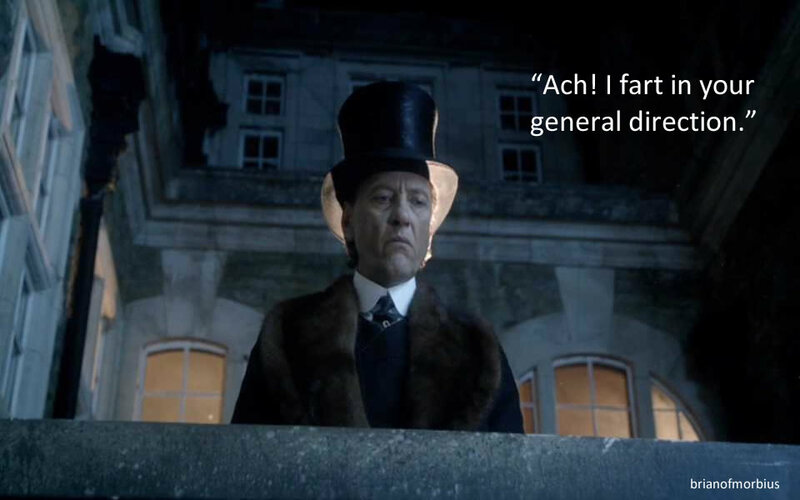 Decent effects and a few big names do not a good story make, and it feels as if Moffat figured he could dump a few interesting characters into Victorian London, create a twisted version of Frosty the Snowman to scare the kids, throw in a few Christmas Carol analogies and then churn it out on December 25th without a single viewer noticing that he hadn’t actually given any of said characters anything substantial to do. It was an episode about the Doctor coming halfway out of the dark, and that’s probably what the show needed, but you can’t just build an hour-long character piece in a show like this if you’re not going to have something that at least vaguely resembles dramatic tension, and at no point – no point at all – did I feel that any of the characters were in any danger, neither from the snowmen or from the ice nanny, or from McKellen’s snow globe / talking plasma ball. Instead I spent all my time wondering who Clara was and where she came from, and given that (as I’ve realised this morning) I don’t actually care, that makes ‘The Snowmen’, for all its efforts, something of a failure. Humbug. Categories: New Who	| Tags: angry birds, christmas, christmas presents, doctor who, doctor who toys, eleventh doctor, sci-fi, science fiction, television, toys	| Enter your password to view comments. Intelligent? Probably. Well-dressed, which would indicate education. There’s a warmth in those eyes, but an air of common sense too. 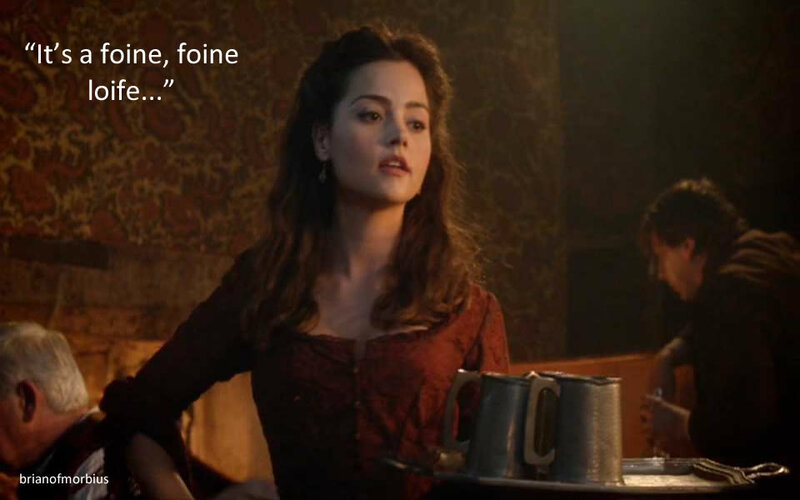 But none of this matters, because the word that invariably gets used to describe the arrival of any new companion – and I mean it, any new companion – is ‘feisty’. Seriously. Look it up. Go on. I can wait. Just Google ‘Doctor Who companions feisty’ (sans quotes) and, for maximum effectiveness, filter the search results so that they exclude anything before November this year (otherwise you’ll just get pages of stuff about Clara). Someone needs to get down to W.H. 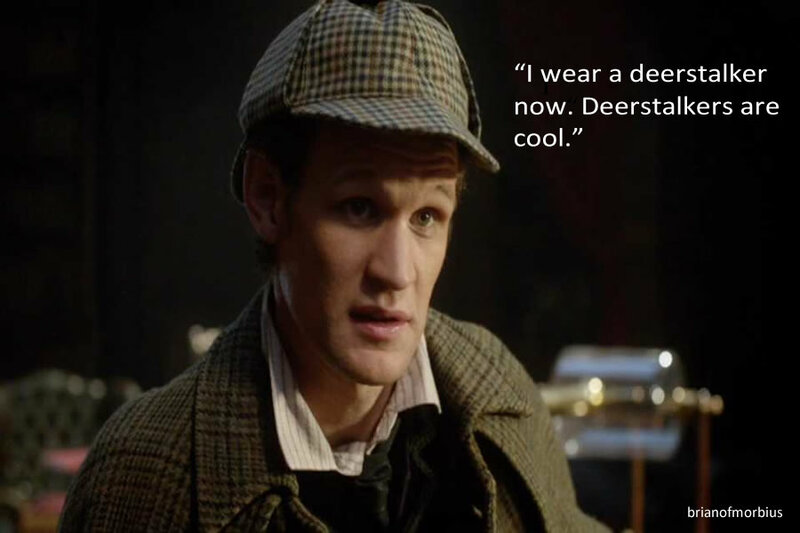 Smith and get Moffat and Coleman a thesaurus for Yule. I think they’re still open. And it’s true, he was. Coming up next on Brian of Morbius: ruminations from Gareth. But first, here’s a little music. Categories: Uncategorized	| Tags: doctor who, entertainment, sci-fi, science fiction, television	| Enter your password to view comments. Word of warning: the image in today’s post is necessarily huge. Hope it doesn’t cause too many browser headaches. Gareth sent this; he originally found it here. It gives new meaning to the phrase ‘attention to detail’, but someone’s taken a lot of trouble to put it together – and, as someone who’s built something vaguely resembling a career in academic publishing, I confess I rather like it. This is what you should all be looking at today. If you’re a PKD fan already, you can use this to help your friends who have yet to discover his brilliance. If you’ve never read the guy, this is a great way to delve in. And well done SJ! Who are you? Who-hoo? Who-hoo? It’s lame. Seriously lame. They insist it’s all scientific, but I don’t suppose for a minute that it is. For one thing, I spent half the quiz thinking “Well, I wouldn’t do any of those things”. It wasn’t even a question of closest possible fit; my answers were just nowhere near. In companion terms, this presumably makes me Adric. There must be a market for a decent quiz featuring companions from Classic Who. What follows is not it, but it will do as a stopgap. And because I don’t really have the time to come up with decent questions, I have stolen all of the hypothetical scenarios you’re about to read, verbatim, from Blade Runner. Reaction time is a factor. 1. It’s your birthday. Someone gives you a calfskin wallet. How do you react? A) Depends. Do you have matching jodhpurs? B) Hope it’s from the Doctor. Is it from the Doctor? Please let it be from the Doctor. C) Try to hump it. Mmm, calfskin. A) Show the jar to the Doctor. Seductively run your finger round the rim. Whisper “spoilers…”. Flash cleavage. Repeat. B) Struggle for ages to open the jar, and then ask the Doctor to help. A) Sigh, then burn it out with your laser pistol. Then delicately lick your fingers, and flash some cleavage. B) Shout for the Doctor. If you can get him to remove it, he might fall in love with you. C) Try to hump it. 4. You’re in a desert walking along in the sand when all of the sudden you look down, and you see a tortoise, crawling toward you. You reach down, you flip the tortoise over on its back. The tortoise lays on its back, its belly baking in the hot sun, beating its legs trying to turn itself over, but it can’t, not without your help. But you’re not helping. Why is that? A) Because the shell’s worth a fortune on the black market, and you owe Dorium a favour. Although you might have to show him your arse first. B) Because the Doctor has a tortoiseshell allergy, and you’re worried about it getting on your fingers, particularly as tonight’s your scheduled ‘accidental brushing against his hand over the TARDIS console’ night. C) Because you’re about to hump it. 5. Describe, in single words, only the good things that come into your mind about your mother. You’re River Song. Ease up on the flirting, huntress. You’re Martha Jones. Stop simpering over a nine-hundred-year-old alien on the rebound and go and finish medical school. You can still be Mickey’s sloppy seconds. You’re Jack Harkness. Get help. There. I think we all had more fun this way, didn’t we? * I was Rose. We’re not going to talk about it.